Sweet Pickle Relish is a sweet tasting, finely-textured relish. It is a bright, almost fluorescent green colour — some describe it as “nuclear” green. It is made from minced cucumber with the skin left on, sweet green and red bell peppers (for red flecks of colouring), lots of sugar, and vinegar. The bright green comes from the minced, skin-on cucumber being blanched with hot water before being pickled. The relish has a very mild tartness to it, making it popular with kids. 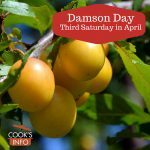 It is sold commercially throughout Canada, where it is one of the three default condiments for hot dogs (ketchup, mustard, relish — the relish being this Sweet Pickle Relish, unless otherwise specified.) A popular brand in Canada is Bick’s; there are also many supermarket own-name brands. Sweet Pickle Relish is also used in Chicago, USA on hot dogs, where some people (oddly) call it Piccalilli, which is actually an entirely different, yellow relish. Some Chicago versions may leave out the flecks of red pepper colouring, though the one made by the Puckered Pickle Co. includes them. Sweet Pickle Relish is not well known in many parts of the States other than Chicago. 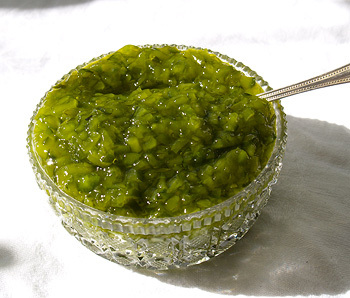 Sweet Pickle Relish is often just called “green relish.” There are other green relishes that some people call “green relish”, though those are mostly what one would tend to call a Chow Chow, as they are based on green tomato instead of cucumber. Bick’s Sweet Pickle Relish was introduced in Canada sometime between 1951 and 1960.